Why I have never set my daughters a curfew or bedtime. I always remember never wanting to be a mother, so when I fell pregnant many years ago now I wasn’t sure what kind of mother I wanted to be. As my belly grew bigger one thing became certain; that I didn’t want to be a mother that argued with her child about unimportant things and got into rows about trivial matters about which I cared very little. All I knew for sure was that I wanted to raise my children to be independent and responsible human beings. Fast-forward through the early years and I found myself very quickly confronted with the pre-teens and all that we are apparently destined to struggle through. The day-to-day arguments about everything and the sage advice from my playground mum buddies who said things like, “just lock them up until they’re 21”. This just didn’t feel like the kind of experience I wanted for me and my daughters. So I decided that perhaps all the parenting advice out there wasn’t right. What if you could make your own rules up in this game? What if you could say to hell with societal norms and create your own? I started with the inevitable bedtimes, because I was even beginning to bore myself with my constant go-to-bed warnings. So when my daughter was 10 I decided that the first thing I would let her claim independence for was her bedtime. I was just sick of all the drama, so I asked myself what bedtime was really about. Why did I feel the need to control it? The answer is obvious; children need their sleep and they can’t handle it themselves! So I conducted an experiment; for a month I decided to put my daughter in charge of her own bedtime and told her as such. Now I didn’t let her just randomly do it; I put a few conditions in place. 1. I will not wake you up in the morning; that is your responsibility. If you are late I will not call the school or give you a lift; you will get to school yourself. 2. If your schoolwork starts to slip because you are too tired I will take the bedtime back for a week and we will start again. 3. You must be out the family room at 9pm. If you can’t handle this I will take your bedtime back from a week and we will start again. Was I willing to put these consequences in place? You bet! Did I ever have to? No, and she is now 19! For 9 years my eldest has had total control of her bedtime. She got good grades, she didn’t die of sleep exhaustion and she isn’t a loser in life, in fact, she has just written her first novel and is in her second year of university. My youngest was a slightly different matter and we have on occasions had to revert and take the bedtime back, but all in all she has it managed. Curfews follow the same kind of pattern; there are several conditions and they stick to them or next time I am likely to not them go out. I have always found children far more capable than we think they are. When we allow them to take responsibility for themselves and learn independence from an early age, I believe we can save ourselves a lot of nagging, pointless arguments and countless headaches. Parenting for me is not about control, it is about freedom, it is about giving our children the freedom to learn all they need to for adulthood. And I get that as parents we want our children to be safe too, but often in our fear to keep them safe we may be stifling their ability to show us how truly capable they really are. Sarah Newton has shared her innovative wisdom with millions who have tuned into her TV and Radio shows, followed her writing and listened to her unconventional talks. She has been described as a catalyst, daring all she meets to break out from social norms and follow their own path. She has worked in youth empowerment for over 30 years, first as a police officer and then eventually running her own business, via a stint at Disney World in Florida. Sarah has a no-nonsense, down-to-earth approach to solving most youth-associated problems, based on tactics that work, not rhetoric out of a book. She often is the only one in the room to stand by her viewpoint and tends to think the opposite from everyone else. Star of ITV’s “My Teen’s A Nightmare, I’m Moving Out” and author of “Help! 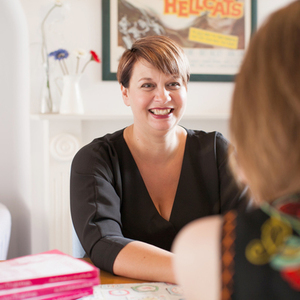 My Teenager is an Alien – the everyday situation guide for parents”, Sarah has just teamed up with her daughter to write a novel to help girls with their body image issues, she has also written for The Guardian, The Huffington Post and the Daily Mail. Sarah also sits on the UK board of the Arbonne Charitable Foundation and is an ambassador for Girls Out Loud.